There is so much turmoil here and abroad that I thought I’d make a card wishing for peace in the world. By the way, I hope I don’t sound like a beauty pageant contestant by saying this! I started by stamping two geometric images from an Altenew stamp set, Dodecagram in Delicata Golden Glitz ink. This is my favorite gold ink and I try to use it whenever I want to add a bit of elegance to a card. The sentiments from Essentials by Ellen Clear Stamps, Brushstroke Christmas by Julie Ebersole were stamped in Scarlet Jewel, an ink from Papertrey ink. Small pearls from my stash were added to the center of the stamped images. The card front was originally 4.25” x 5.5” but I realized that it looked a little bare so I trimmed it down and added 2 thin strips of cardstock in Scarlet Jewel (by PTI) and Antique Gold (Stardream Metallic cardstock) on the left side. All of this was mounted onto an A2 top-folding card base. The result was simple and I liked the richness of the colors in the card. I think the combination of the Scarlet Jewel (a rich burgundy-red) and the Antique Gold lend an elegant look. 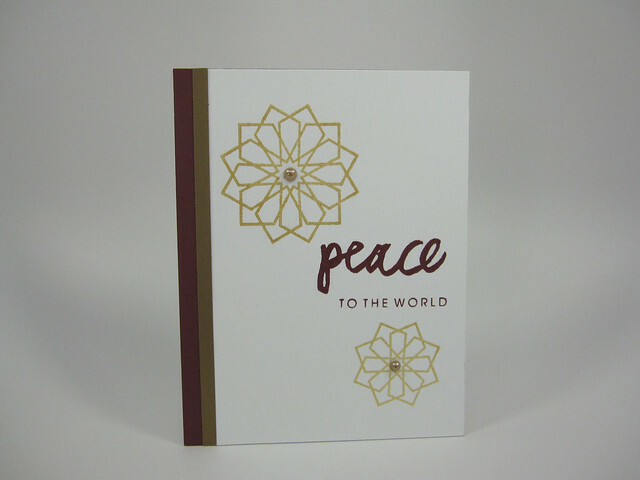 I love the “peace” sentiment in the brushstroke font paired with the thin block letters of “to the world”. The two fonts are a nice contrast to each other. Hope you like the card! Supplies used in making this card – Stamps: Dodecagram by Altenew, Essentials by Ellen Clear Stamps Brushstroke Christmas by Julie Ebersole; Inks: Scarlet Jewel by Papertrey Ink, Delicata Golden Glitz by Tsukineko; Cardstocks: Neenah Solar White (80 lb. for card front and 110 lb. for card base), Scarlet Jewel by Papertrey Ink and Antique Gold by Stardream Metallic. Other: Pearls from Hero Arts. This entry was posted in Holiday Cards and tagged Altenew, Christmas, Essentials by Ellen, Papertrey Ink. Bookmark the permalink.